Guides – Our guides are the best in the business, most with over 10 years of experience and all with a willingness to go the extra mile for our anglers. Our guides also use polling platforms and trolling motors and spend way more time looking for big fish and sight fishing. 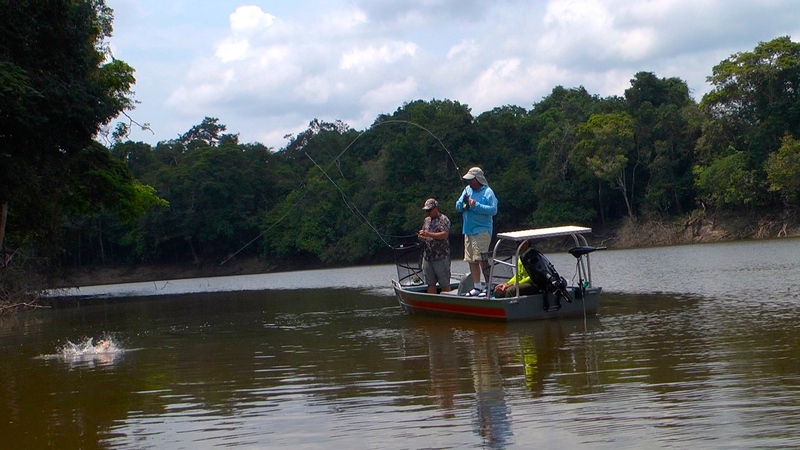 We are the only operation in the Amazon for Peacock Bass with both trolling motors and polling platforms on boats that can also easily be moved in and out of land locked Lagoons. 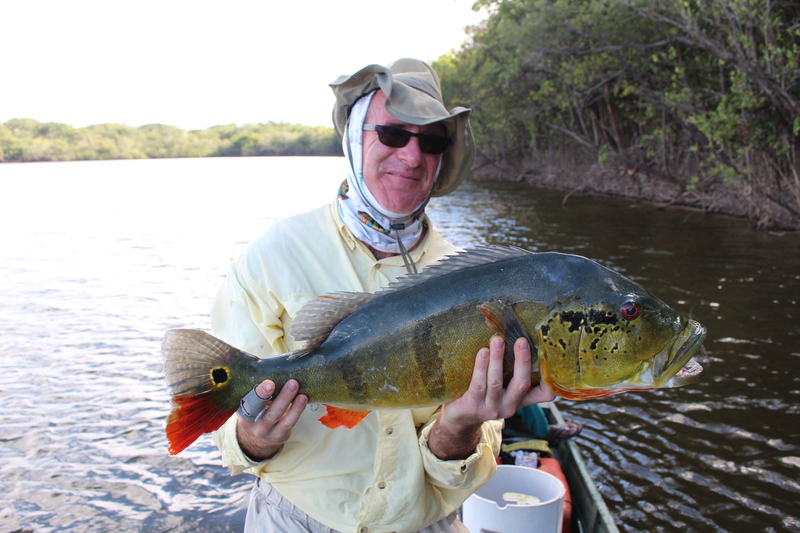 Exclusiveness – The Xeruini River offers our clients secluded, Private remote fishing opportunities with no fishing pressure. Comfort – Our Floating Cabins and Our River Barge are both air conditioned and very spacious. The River – The Xeruini is known in the Amazon for being one of if not the clearest rivers. It also is not affected as other rivers by rain and high water. When other operations have to re-schedule and even cancel trips the Xeruini continues to fish well. Clear water also means way more sight fishing opportunities. Service – Unparalleled in the industry. Homemade soups and bread, daily laundry service and an attitude that keeps our guests coming back for more. 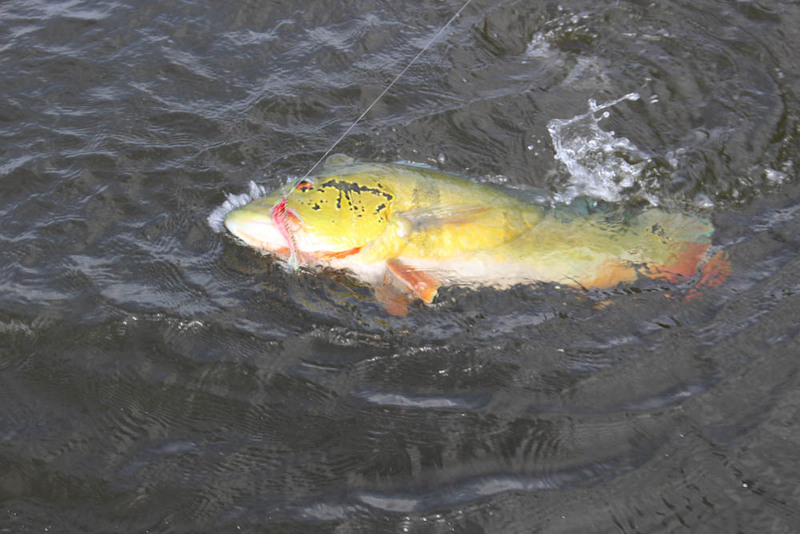 There are literally thousands of tributaries that are fishable in the Amazon Jungle. They range from small clear creeks to huge Lagoons. 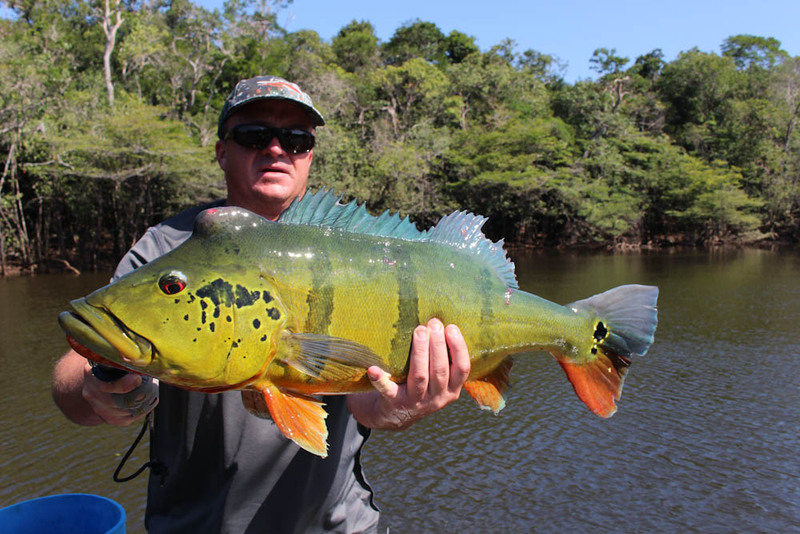 Over the last 20 years our team has fished and scouted the Amazon to come up with the very best fishing options for our guests. We have taken into consideration all of the things necessary to make our fishing trips stand apart from the competition. The Xeriuini River is located in Roraima Brazil in the Northern part of the Amazon Jungle. It is a huge river with over 100 lagoons and 200 miles of river. It is a “Black Water” river with crystal clear springs and tributaries feeding it. The river is well known for not only numbers of fish but big fish as well with 4 sub species of Peacock’s living in it’s waters. There are Butterfly and Orinoco Peacocks reaching over 10 pounds and the largest Peacock the Azul reaching over 20 pounds. There are also many more species of fish to be caught in the river including various types of catfish, Arapaima, Arawana, Payara, Jacunda and Traira just to name a few. Our new lease on the river with the Indian Tribe of Terra Preta Village near the mouth of the river and with the Brazilian government allows us exclusive access to fish the entire Xeriuini River except for a 30 mile stretch in the middle of the river where another smaller operation exists. We have the entire lower river down to the mouth and over 100 miles of the upper river including some amazing headwater springs that are clear and full of fish. Having both the lower and upper river gives us the opportunity to follow the flows and fish the area of the river where the fish are. In the Amazon fish move in and out of rivers and lagoons with the high and low flows of the water. This year we will only take 4 weeks of anglers to our new exclusive upper headwaters area. Only 30 anglers are going to get to see a very wild part of the Amazon that has not been legally fished ever. Less people will get to fish this river than climbed Mount Everest. We have a small house boat in place on the upper river that is being remodeled in Terra Preta Village this summer. It has 4 fully air conditioned angler cabins with side by side beds (no bunks). An air-conditioned dining room totally made of Brazilian hard wood. an open air upper deck for evening enjoyment and a full service wait staff with daily laundry service. Our boats are one of a kind built from scratch with Peacock Bass fishing in mind. There are two large angler platforms so both anglers can fish at the same time. Plenty of storage to protect gear during a rain storm. 30 HP outboard motors, trolling motors and a Polling platform for the guides. The boats are 18 feet long yet small and light enough to navigate small creek channels, shallow water and even can be pushed into land locked lagoons that could be loaded with fish. These are the best Jungle boats in the Amazon for Peacock Bass. Not only are you getting to go on one of the most exclusive fly fishing trips in the world with us but you are also helping out a jungle community in the process. 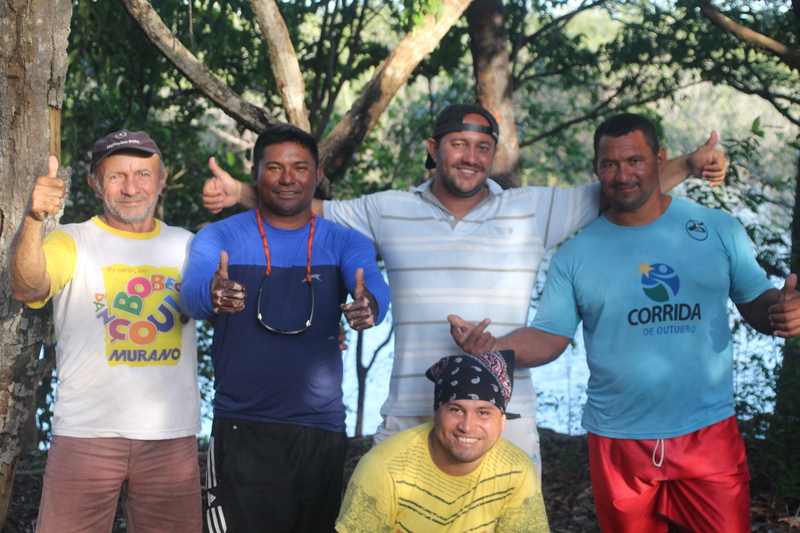 Every angler we take to the Xeriuini River Preserve helps make the living situation for the villagers better. We are committed to these people and they of us and the heart warming feeling you get from spending a week with these people is hard to beat.